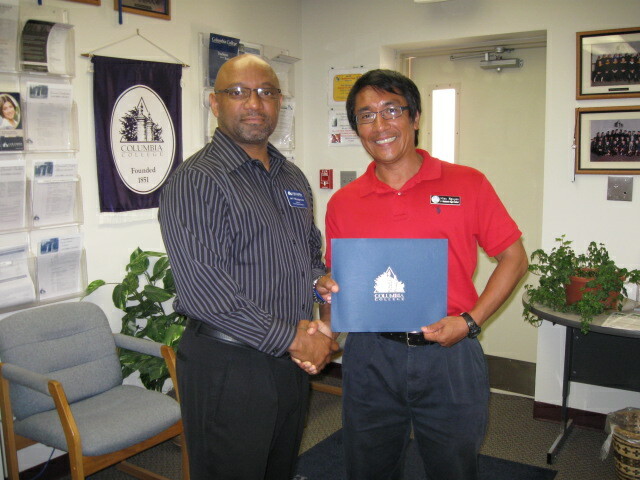 Director of Columbia College–Patrick Air Force Base Jeff Musgrove congratulates Hieu Nguyen for winning the 2011 Festival of Writing (graduate division). Hieu K. Nguyen, a student in the MBA program, is the 2011 winner of the college’s Festival of Writing (graduate division). Nguyen, with a 4.0 GPA, has been taking classes online but is affiliated with the college's Patrick Air Force Base (Fla.) location. He will graduate this May. Nguyen was born in Saigon, South Vietnam, and came to the U.S. when he was four. He served 20 years in the U.S. Air Force, living in several states. Upon finishing a successful military career, he faced a bad U.S. economy and one of the toughest job markets in recent history. He set a new goal to acquire an advanced degree that could lead to opportunities despite hard economic times. Because of his high personal expectations and persistence, Nguyen was attracted to the excellent quality of Columbia College's online services.